Good morning everyone. 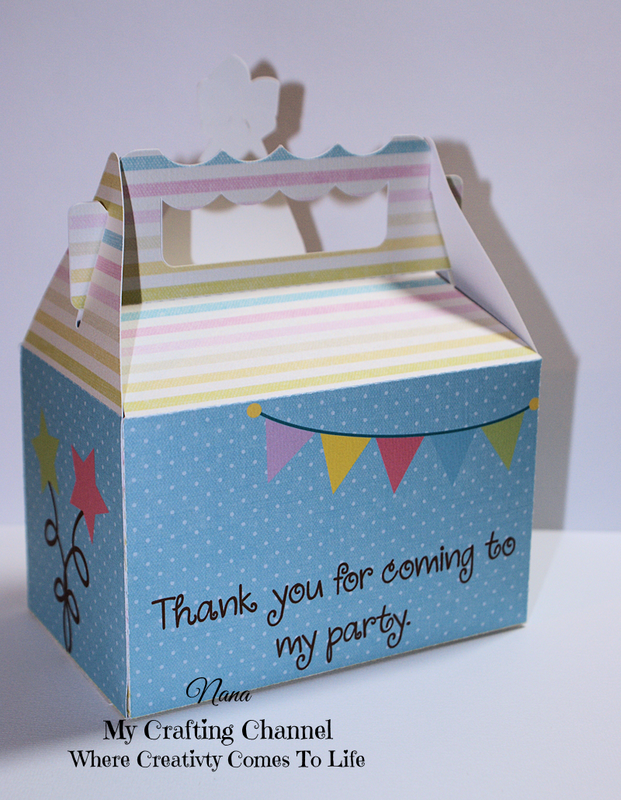 Hope the weather is as fine where you are as it is here in PA. Today I want to share with you this cute treat box. I really love the smaller version of this box that I have been making for years but this new larger version hold much more treats. Thanks to my dear husband who bought me a large format printer I'm now able to make the larger boxes and still be able to print the digital paper right on the box prior to cutting it out. Someone ask me if I print out or flood fill all my cards, boxes etc. The answer is yes. I have only purchased 2 card stock stacks in the past 5 years. I love being able to use digital papers. I find I spend less on ink than I did buying paper pads or card stock stacks in the past. It seemed I always had many sheets left in each pad or stack that were papers I would never use. I now do not have that waste as I only buy papers or find FREE papers that I like and once purchased I have that file FOREVER and it will never be discontinued. Now on to the box. I flood filled the top and bottom of the box with different digital papers. Added the white border in Silhouette around the little girl and used Wink of Stella on the hat, her hair bows, shoes and the bow on the present. The glued her to the front of the box. 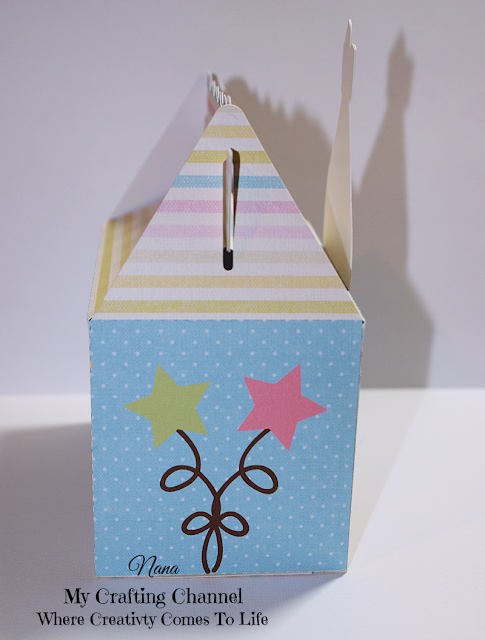 Added some images to the sides the cute banner on back and the text to the front and back prior to cutting out the box. 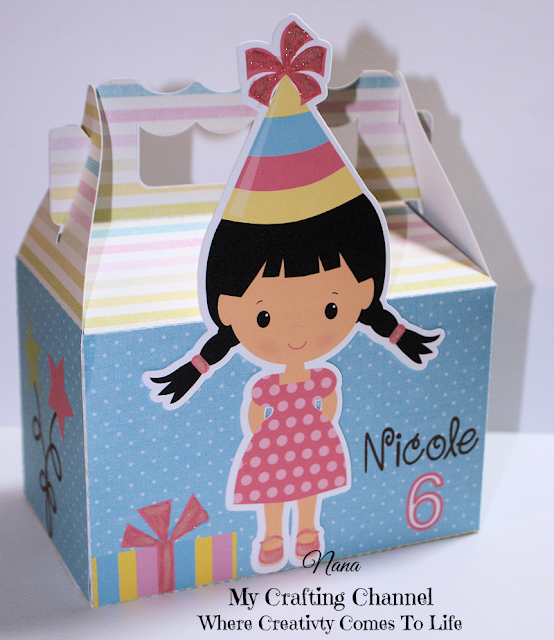 Perfect for any little girls birthday party. Wow this is such a pretty box. I love the little girl.How sweet of your husband to get you a new printer. Your treat box is adorable! Love the sweet girl too! Now I know how you always have the perfect coordinating papers for your projects, I have never played with digital papers but am very intrigued! Thanks so much for sharing! How cute is this!!! I love how you decorated the box. It is just Adorable!! The image of the little girl is darling!Absolutely adorable! Adorable! What a sweet little party girl, she is so cute! This is darling Nana! The little girl is so darn sweet! love it! such a sweet wee one! What a adorable box!! Love that sweet little girl image!!! Have a great day. This is such a sweet little box! I love that you added a thank you to the back of the box!